It is important when shopping for cutlery to understand what some of the more mysterious terms mean. Often cutlery manufacturers will not be strictly specific about metal components in their cutlery, and will only reveal to the consumer numbers which are designed to indicate metal content. These numbers are typically demonstrated as being 18/0, 18/10, or 18/8. 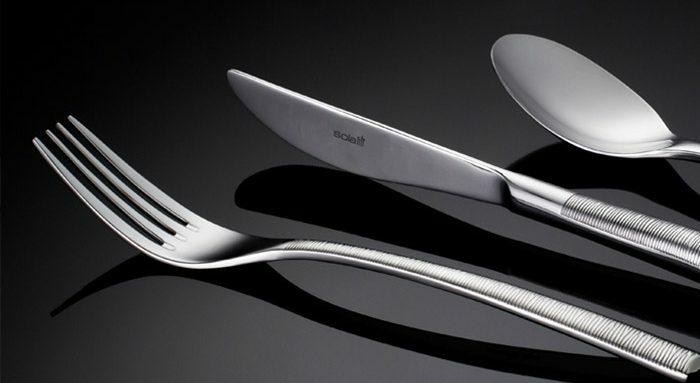 While cutlery for the most part is made from stainless steel, the 18 in this instance refers to the percentage of chromium content and this second number references the percentage of nickel present. So, if a cutlery knife were to state that it was 18/0, this would mean that in addition to the stainless-steel alloy 18% of the knife is made of chromium and 0% is made from nickel. Why are these metal components in cutlery so important? While the metal component may not appear important on a surface level, the addition of alternate metals to stainless steels greatly add to the longevity of cutlery. The nickel component of cutlery is introduced as a way to protect the cutlery from rust and corrosion – in the instance of a knife produced to a 18/0 specification, the complete lack of nickel content will increase the risk of your cutlery developing rust. For this reason, 18/10 should always be sought out for those wanting to properly invest in cutlery. In having an 18/10 set, despite the potential for a higher cost, there is an assurance of a far longer lifespan. In conjunction with the superior materials used, 18/10 represents a significant investment for those who appreciate good cutlery. Where to invest in 18/10 cutlery? JM Style have recognised the need for high quality cutlery being easily available for consumers. This is why we stock the amazing range of Sola cutlery. This range features a wide variety of 18/10 cutlery in an assortment of interesting styles, meaning that any taste can be catered for in this quality-centric range. 18/10 is also available with a PVD coating, which allows for superb appearances apart from a metallic silver finish, such as matte blacks, coppers and golds. If you have further questions regarding the benefits of 18/10 cutlery, or the potential styles that are available today (including the monobloc knives), please don’t hesitate to contact us. Our friendly staff will be more than happy to walk you through the best options.